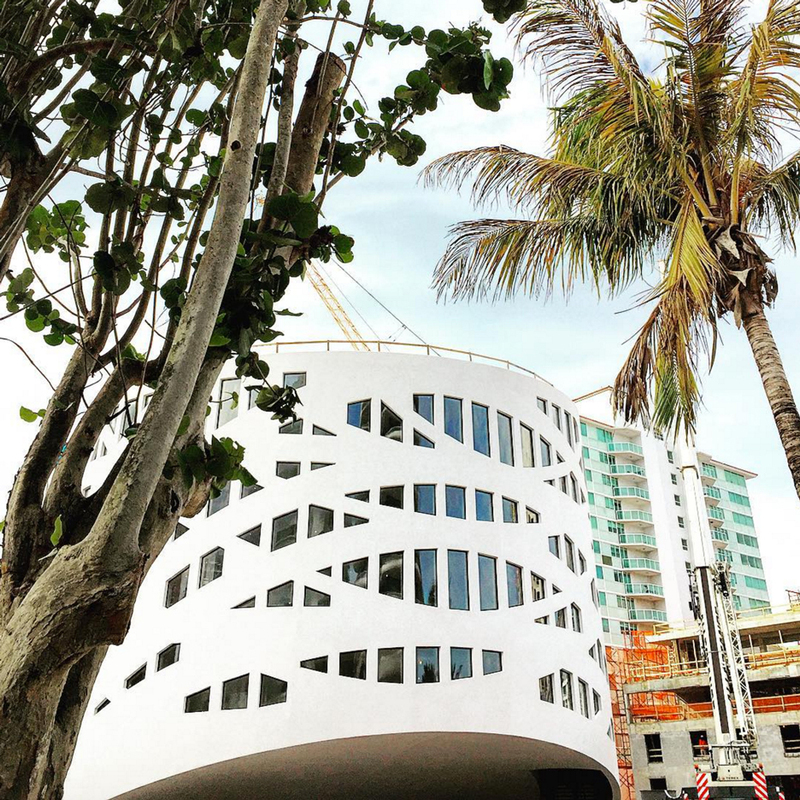 Construction is well underway on OMA's drum-shaped Faena Forum cultural centre in Miami Beach, which was influenced by the Guggenheim Museum in New York according to the project's lead architect. The 42,565-square-foot building (3,954 square metres) is made up of a cylindrical hall fixed to a rectangular box. Its scale and distinctive form were inspired in part by the size and shape of Frank Lloyd Wright's iconic Manhattan museum, according Shohei Shigematsu, a partner at Dutch firm OMA's New York office. "It has something of the magical scale of the Guggenheim," he told press earlier this week. "The form echoes the curve of the Faena Hotel across the street as well." The Faena development has been led by the Argentinian real estate developer Alan Faena. His project includes the renovation of several Art Deco hotel buildings, a new residential tower by Foster + Partners, and a parking garage with elevators for cars and people that will be visible on the exterior. The developers are hoping to create a walkable mini-neighbourhood on the thin strip of land between the Atlantic Ocean and Indian Creek, between 32nd and 35th Streets, which they are calling the Faena District. "We want the building to create a neighbourhood and claim a centre," explained Shigematsu. Once complete, OMA's forum will host an ever-changing roster of performances, lectures, events, and exhibitions. "It's a cultural machine," Shigamatsu said. Its concrete exterior provides the structural support for a cantilever over the entrance, creating a protected area to welcome visitors into the building. The concrete drum, filigreed with angled openings for windows, also recalls the leaves of a palm tree. "We thought it was appropriate for Miami," Shigematsu said. According to Shigematsu, the placement of the windows around the building is designed to set up visual relationships within the round-walled hall to the other buildings in the district. The building is also designed to withstand the hurricane-force winds that regularly batter the city. Though the shell is complete, much of the interior needs to be built out. The forum is expected to open in 2016, though Faena has already begun hosting programmes and partnerships with other organisations in the Miami area. Faena previously redeveloped an abandoned area of Buenos Aires, working with Norman Foster and Philippe Starck. "I believe in collaboration to really make big changes in cities and in the world," Faena told Dezeen in an interview last year. "And I like to work with the best minds and, together, create the best, no? I create the script and working with each one of them allows us – even though there's a lot of different minds – to be all lined up."